This year the MV Lyubov Orlova became a news sensation as reports of its ghost ship status and subsequent sightings flitted about the internet. As strange as the Orlova’s story is, though, it can never rival its sister ghost ship, the SS Baychimo. The Baychimo began life as the SS Ångermanelfven in Sweden in 1911 and quietly plied the Sweden-Germany trade route until she was handed over to the British government as part of Germany’s war reparations after World War One. Acquired by the Hudson’s Bay Company, the ship was renamed Baychimo and dispatched to the New World to carry goods, especially furs throughout Canada’s upper reaches. The saga of the Baychimo took a strange turn when, on October 1, 1931, she became trapped in pack ice and was abandoned by her crew. The next few months witnessed several on-again, off-again attempts to winter with the Baychimo in order to bring her safely to port. At one point, the Baychimo broke free of the ice and, unbeknownst to her crew, floated away. 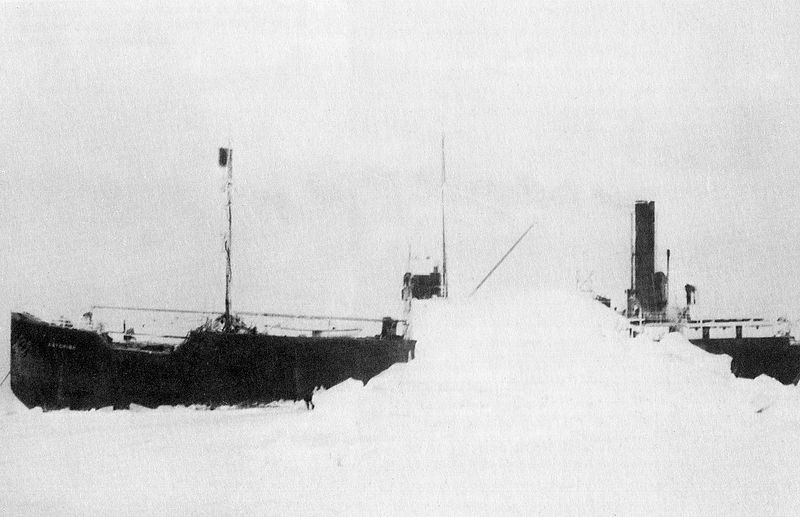 After successfully locating the vessel, the crew offloaded the ship’s cargo and abandoned her to the vagaries of the Arctic. Over the next 8 years, the vessel was sighted several times and even boarded on occasion. Although the vessel was last physically boarded in 1939, Inuits reported sighting the Baychimo as late as 1969. This last sighting has often been called into question, but what is without question is that the ship continued her ghostly haunting of the Arctic Sea for years after her abandonment. The Baychimo’s final resting place, if she has indeed sunk, has yet to be determined. Who knows, perhaps she is still wandering the vast expanse of the Arctic in search of her next cargo.